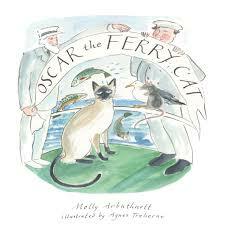 Oscar is an ordinary cat until, one day, his life is turned upside down when he finds himself alone on a ferry. Will he ever find a friend and somewhere he can call home? Molly Arbuthnott is a primary teacher. Born and brought up in Scotland she feels the sea and mountains are part of her home and heritage. Having worked with children she understands what young children most relate to and enjoy; namely repetition and simple catchy language. A charming book. much enjoyed my two children. The simple story is matched by a gentle wit and turn of phase. What a charming tale! Children will love to read this and have it read to them. This book helps children to use their imaginations when dealing difficult issues, such as loss. Beautifully told & illustrated, and exactly the life I hope Oscar had after he went missing. Love this book and illustrations! A beautiful story, born out of loss. An important step for children to learn, wonderfully told, perfectly illustrated. This book is a must! This is a wonderful book. The pictures are so lovely and the story is really engaging. Molly’s story/prose is adorable – long live oscar. Agnes Trehernes illustrations are dreamy. All in all a perfect gift for 3- 8 year olds. Tale all ages will love! Best present I could have bought for my neice! A lovely story, loved by myGrandchildren! A wonderful book – beautifully written and illustrated. What a lovely, gentle story this is. Beautifully written and wonderfully illustrated. Loved by young children and very much appreciated by their parents and grandparents. A particularly charming straightforward and readable children’s short story in the classic sense; emotive and based on a true story. The illustrations are delightful. Molly’s enchanting book was the first children’s book I bought as a grandmother-to-be. My granddaughter was born in January, and I can’t wait to introduce her to Oscar! A brilliant children’s book based on a true story, beautifully written and illustrated. An absolutely delightful book. Just the right length, so that it can be read at a sitting; the writing very clear, but not in the least patronising. Looking forward very much to its sequel. Wonderful illustrations. A delightful story – Look forward very much to a sequel. Beatifully written and illustrated. Lovely tale of love and loss. This is a lovely story and I have enjoyed reading it to my grandchildren. No Family home is complete without this charming tale . Perfect read for all ages! A very good book. Imaginative , gentle and a wonderful memorial for Oscar. Wonderful book – given to four grand children all enjoyed it equally. Wonderfully illustrated, simple and truly entertaining! Beautiful book, has made its way to my grand niece Lola in New Zealand and my Granson Joseph in Inverness.The adventures of a well loved family cat, lovely illustration and beautifully written. A touching story, beautifully illustrated! A tremendous book which I know children will enjoy hearing time and time again, so that the gentle lessons within the story will sink in. Beautiful book – my daughter and I both love reading it! Stunning book beautifully illustrated great for children and parents hope it wins the prize. As the children join in with each repeated phrase, this story’s ability to captivate and charm is clear. A really lovely book. A charming story, gently told and written with great sensitivity. The first in a long series, I hope. A lovely heartwarming story, beautifully illustrated. We had a great read with all the family and led to thoughtful conversations afterwards and beautiful illustrations . A delightful if sad story and delicious illustrations. Enjoyed by our grandchildren and ourselves! A quote from our little boy, “My favourite character is the little mouse and I like to find him in the pictures”. Freshly and imaginatively written and illustrated. A really lovely children’s book. A beautiful book , well constructed plot with delightful illustrations…a winner…roll on the next book. We loved the book and are really looking forward to the next one and the next….. ! Hope there will be many more! Wonderful take that all will love! I hope there will be many more Oscar stories! I wish Oscar well with all his subsequent adventures! I think Molly’s story telling complements the story itself perfectly! I wish I could hear the story again and again! Great adventure. Oscar feels real down to the way Molly writes about him and you get sucked in right from the start. Agnes’ illustrations are spot on as well. Lovingly drawn and wonderful colours. Oscar and Molly deserve an Oscar. Chuffs, my business, are enjoying selling this delightful book at charity/business fairs. It is told so well and beautifully illustrated. Our grand children loved it. Congrats to Molly. My two sons (5 and 2) loved these books and we have read them so much if I deviate away from the storyline I get corrected or told I missed a bit. The clear winner, a great little book and a lovely read. My niece loves this book! Wonderfully written & beautifully illustrated. Great job Molly! It is a pleasure watching the pleasure these books give to the children I have given them to – I highly recommend them and hope their success inspires Molly to write more. Loved this children’s book, bought for my grand niece. Such a lovely story to come out of a sad situation. But Oscar is still alive through this book. My granddaughter loves me reading this to her. Cats and boats with a fun ending. What’s not to like? Libro divertente e buone illustrazioni. Adatta a tutte le età. A fabulous book with excellent presentation. A credit to the author. A truly delightful book with beautiful illustrations! The most gorgeous little book with a beautiful story line and magical illustrations. A true gem. A wonderful story with beautiful illustrations which the grandchildren thoroughly enjoy. A wonderful story, so engaging and so charmingly illustrated. Congratulations to Molly on a wonderful book, so beautifully illustrated. Charmingly written story with lovely illustrations. Immensely proud of Molly – a natural writer from an early age, she continues to engage with children and all ages. A beautiful book which adults and children love to read. A sad tale of a lost and much loved cat given a happy ending which lets us think that Oscar has found a happy new life. Lovely illustrations! My Grandchildren enjoyed the book and so did I ! A lovely book. More Oscar stories, please! This book will be even more successful than the last. A lovely story perfect for a child’s imagination. A lovely book, much enjoyed by my grandchildren. We have given copies of OTFC to all our god children and also as presents to friends across the world. We love it and the sequel. Delightful! Enchanting storyline and Granny enjoyed it as much as the children. This is an absolutely delightful book enchantingly written and illustrated. I so enjoyed reading this book to my Grandson, such and good story and well written. Enchanting book – more Oscars please. A beautiful book that my children absolutely adore. The author’s tone is enchanting and we all love the pictures of Oscar! I have bought copies for each of my godchildren to pass on the magic! Just the sort of story young children love. Once they’ve heard or read it several times they almost know it off by heart and Oscar becomes their special friend. My granddaughter loves both the story and the drawings – and I do too! We read it A LOT ….. I knew Oscar….such a brave wee cat!! Such an adventurous cat…such a memorable cat….We want MORE! I read this lovely story to my Primary 1 class and they loved it! What a fab story and the illustrations are beautiful! A beautifully produced book and captivationg story. A perfect gift for the young. Lovely book. Love the characters especially Oscar! My daughter’s fave – and ours too! Utterly charming. A great book by a very talented Author! Wonderful book – just loved it! Very lovely book and a talented author. An entrancing book which is sure to delight young readers. I look forward to hearing more from Molly. Talented young lady, lovely story which I read to my children over and over. Look forward to more well done Molly.